Toxic people – we have all had them in our lives and some even feel that they have “jerk magnet” tattooed on their foreheads. It’s easy to blame the offenders for wronging us and it’s even more easy to say that all we attract is jerks when we constantly feel victimized, but when we get down to the heart of the matter, in far too many cases, we fall victim to our own inability to demand better treatment for ourselves. Other times, we get far too involved with toxic people not by choice, but rather by circumstance. Whatever the case, many of us find it difficult to say goodbye to those who do us harm. Sometimes, our relationships are so convoluted that we don’t even realize that the person we are involved with is bad for us. They may be charming, fun, funny, intelligent, affluent, or bear any number of other positive characteristics that may cloud or thinking or logic when it comes to evaluating their influence in our lives. For example, many people find love partners who show many of their positive attributes especially in the beginning of the relationship, and because they are so charmed by what is right about their love partner, they either don’t see their partner’s negative behaviors, choose not to see them, or do see them but minimize the effect this negativity may have on them down the road. When time goes on and their love partner is no longer trying to put their very best foot forward, those negative qualities become much more pronounced and depending on what they are, can even be abusive. This is not to say that just because we may see some aspects of our partner’s character as negative, the relationship will inevitably be toxic. However, if we are faced with a situation in which we feel our lives are being affected to the point where our quality of life is being compromised, that relationship definitely is toxic, and we absolutely have to kick the toxic person to the proverbial curb as soon as possible for our own sake and safety. So how do we do it? How do we get rid of someone who is toxic to us? Oftentimes it is not as easy as it seems. When it is a family member who is affecting us, we are likely to give them chance after chance to rectify the situation. Most of the time, we will choose to be in pain due to the offending party’s actions rather than cut them out of our lives completely, especially if it is our child. What if it is a love partner and we feel that it hurts far too much to let them go – far more than putting up with their poor behavior or even abuse? What if it’s our boss that is making our lives a nightmare but we have worked far too long and hard to give up our position in our careers? What if we depend on the toxic person financially and we feel we have no choice but to put up with their behavior? I don’t have the answer for all of these questions. Every single one of us is in a unique situation which we evaluate differently according to each unique factor which defines our relationship. What I do know is that all too often, we do not value ourselves and that is what makes it hard for us to leave relationships which do us harm. So, the first step is for each of us to take a good, long, hard look at ourselves and ask ourselves why we allow others to treat us this way. Is it because we feel that we deserve it? Is it because we feel that it would be dangerous for us to leave? Is it because we feel that we can’t handle that person not being in our lives? Then we need to follow up the important questions with why we feel that way in order to come up with some honest answers, and take necessary action. If you can touch her heart without touching her. I really appreciated and enjoyed your article because that’s exactly what I’m going through to an extreme because now I’m all alone, homeless, jobless, and I don’t even have a car. I’m left with my duffel bag of clothes and the homeless shelter…..no friends and no family, but at least I’m no longer their rug to walk on. I’ve been teased and tormented all my life by the people I thought were my family for being bi-polar, yet I didn’t realize that they didn’t even love me at all until now. I’ve always been independent and have helped others when I could but now I’m a 44 year old orphan because I made the mistake of falling in love with an abusive sociopath and by the time I left I wasn’t working anymore so I asked those people I knew if I could stay with them temporarily and get back on my feet, only one of them (who I used to call my sister) said okay and informed me that I wouldn’t get a house key and it better not be long. I said well okay, so i was up every morning by 7 am job hunting and in return for the help I did all the housework and remodeled her bathroom for free. After about a week, she’s asking daily when I can leave and eventually starts calling me things like “loser” and “piece of crap” then finally she told me to leave and suggested I go back to the guy that abused me and almost killed me. At that point i realized that she didn’t care if I was alive, dead, or suffering yet I had been calling her my sister all these years, along with the rest of them that wouldn’t help me at all unless I came with rent money right away. So I went back to being abused just to have a roof over my head and stayed as long as I could possibly bear it. This whole 6 months I’ve been on the internet, doing walk-ins, and placing phone calls trying to find a job. Now I’m left with nothing and nobody, and my only property is a duffel bag of clothes and the only person willing to give a place to stay is my abuser so I selected option “B” …the homeless shelter. They always thought I was a sissy because I’m big hearted and compassionate. So here I am struggling to survive and not knowing how long it will take to pull myself out of this situation, but I’m no longer their rug to walk on. I won’t miss any of them now that I’m feeling a little self-worth and the only reason I’ve had the strength to choose homelessness over an abuser is because I pray for strength everyday. God will carry us when humans won’t. Michelle, thank you for sharing your story. I think you’re extremely brave. There are some great resources out there for people in your situation. I hope you choose to use them all. I’m pulling for you and I know that if you’re brave enough to put yourself first, you’re going to go nowhere but upwards. You are very brave and in my prayers from afar. Thank you for such wisdom! Keep it coming! Great article.. Although i am following the path of the Bodhisattva and a have had toxic people in my life and i have a different perspective. Being a Bodhisattva does not mean you allow to walk on you, but you look at those ‘toxic’ people differently. Like a mirror.. they often reflect our own shadow. The journey is in accepting someone as they are and there are huge rewards for staying in a relatioship with some one who you think is toxic. you become a better person and have the opportunity to see how the toxic person serves your life. and 95% of the time they are good people who are in pain. Toxic people are those who put your life in danger…. not some one who you just don’t agree with their life or choices…. 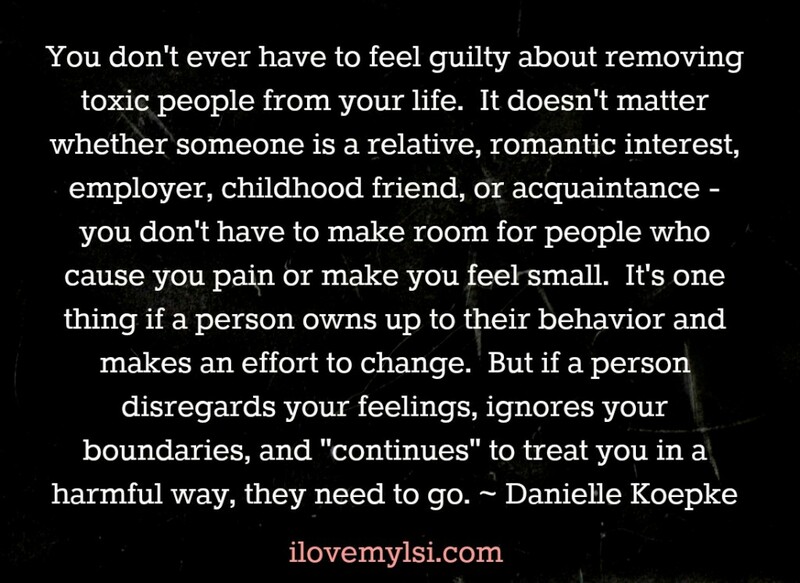 because you know, if toxic people leave… then there is nothing to fix.. THEY were the problem, not ME…. Sophie, dear lord, it’s so refreshing to see someone who thinks the same way as I do. Thank you!